L S HIRSCH & CO. The J. C. Orrick & Son co.
Tobacco, Cigars and Snuff, Woodenware of All Kinds. Proprietors of the "Narrows" brand of Canned Goods. "Home Mills" strictly pure Spices. "Home" Flavoring Extracts. The Foss-Schneider Brewing Co's Cincinnati Lager Beer. CUMBERLAND, MD., SEPTEMBER 24, 1889. INCLUDING MINER'S PARADE, At 10 a. m., from junction of Water and Washington Sts. Baloon Ascension and Parachute Leap From a height of 5,000 feet, by Professor Hunt, at 2 o'clock p. m., from the lot back of Queen City Hotel. Base Ball, at Association Park, 3 p. m., McKeesport vs Scottdale. 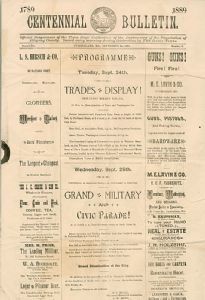 Lawn Tennis, Washington Street Grounds, at 2 p. m.
on the Potomac river at 7:45 o'clock p m., during which time there will be a Parade of Beautifully Illuminated and Decorated Boats and Canoes, headed by the "Steamer Endeavor" with selected Bands. Stereopticon Views at Market House Square. FOOT-BALL, at Association Park, 9 a. m., ECKHART vs. BARTON. GRAND * MILITARY * CIVIC PARADE! At 10 o'clock a. m., head of column resting on South Centre St.
Baloon Ascension and Thrilling Parachute Leap from height of 5,000 feet, by Professor Hunt, at 2 o'clock p. m.
Base Ball, at Association Park, 3 o'clock p. m., McKeesport vs. Scottdale. Grand Bycicle Parade at 8 o'clock p. m, Wheels illuminated and decorated. Open-Air Band Concert on Baltimore St., 8 o'clock p.m.
Stereopticon Views at 8 o'clock P. M. at Market House Square. Grand Illumination of the City. In addition to the above there will be Dramatic Entertainments at the Academy of Music each night, a Circus, Merry-Go-Rounds, Side Shows, &c.
Excursion Trains on all railroads. F. C. BEALL, Chairman Executive Committee. A. H. BOYD, Chairman Literary Committee. M. E. LAVIN & CO.
ever offered to the public in Western Maryland. In the mean time give us a call at the old stand, Cor. Centre and Baltimore streets, where you can find anything that is handled by the Hardware trade in Maryland. 9 N. Centre St., Cumberland, Md. To have your PIANO TUNED. Bought, Sold, Exchanged. Fire, Life, Accident. Office, 33 Baltimore St. Cumberland. Our prices the lowest in all Maryland, and it is to your benefit to buy from us and save 10 to 20 per cent.